In order to conduct the collaborative activities of ZCP across the country we rely on a close-knit management team to coordinate with all projects, partners and stakeholders. 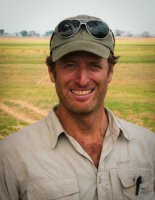 A wildlife ecologist, Matt joined the project in 2008 as the CEO and Programme Director and oversees all research, conservation and capacity-building/education efforts for the organization. An Affiliate Research Faculty at the MSU Department of Ecology, he has over 25 years experience on a variety of wildlife field research and conservation projects in North America, Antarctica, and Africa, studying numerous endangered species. Matt conducts and coordinates programme activities with the support and collaboration of the Department of National Parks and Wildlife (DNPW). His fields of research interest and expertise include predator-prey dynamics and conservation biology. Matt is also an Honorary Wildlife Police Officer for DNPW. Thandiwe is a senior ecologist at ZCP and Manager of the organisation’s Conservation Education Program. She grew up in Mfuwe and was a former conservation club member. She joined ZCP as an intern in 2009. Thandiwe holds a Master’s degree from the University of Arizona and her thesis focused on lion demographic response to conservation policies in the Luangwa Valley. As a supporter of community-based conservation, Thandiwe is dedicated to exploring effective ways of integrating local communities in wildlife conservation and increasing the representation of women in the field. Her future research interests include human-carnivore interaction in a changing landscape. In 2016, Thandiwe was named a National Geographic Emerging Explorer for her efforts to protect lions in Zambia. Masauso Nkhoma joined ZCP as Accounts and Administration Assistant in May 2016. He was born and educated in Lusaka, where he began his training as an accountant. Over the course of his career he has worked in both the commercial and non profit sectors, including tourism, the food industry and now conservation. In his spare time, Masauso is studying to take exams for higher level qualifications in accounting and taxation, with the Zambia Institute of Chartered Accountants. Caz joined ZCP in 2014, after completing her masters in Cape Town. Her thesis focused on the use of underwater camera traps to monitor species abundance and diversity of fish in marine protected areas. Prior to joining ZCP, she worked on various research projects across Africa, including okapi in the Democratic Republic of Congo and gorillas and chimpanzees in Gabon. Caz has worked across all three sites, including as Project Manager ZCP’s Kafue Project, and is now the Training and Operations Manager for ZCP.